People have breakfast at a VFW fundraiser before the Pendleton Roundup and Rodeo gets underway. 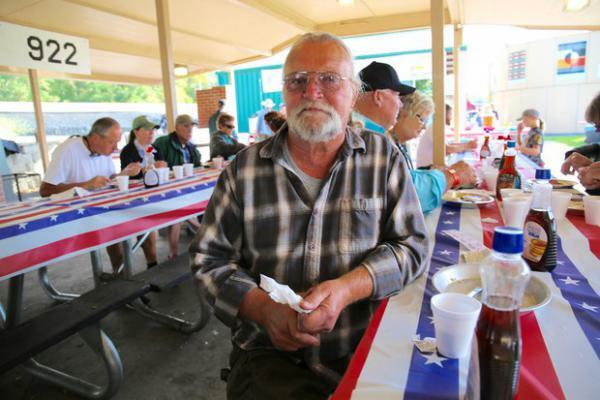 Chris Eggo of Pendleton has breakfast at a VFW fundraiser. An army veteran, he says, "I'm not really a [political] party kinda guy." Still, he registers to vote as a Democrat, and he says his best friend is a Republican. 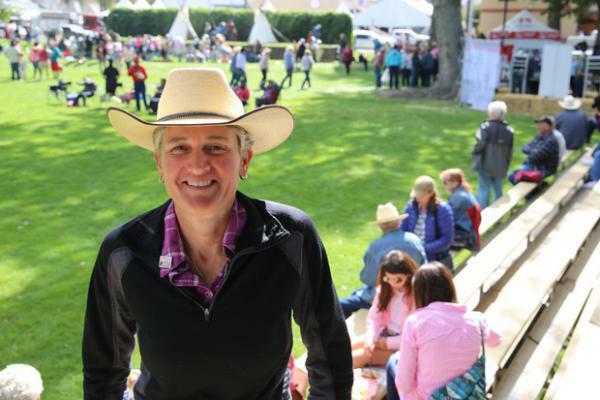 Democratic candidate Jamie McLeod Skinner had a slew of events in Pendleton during the Roundup. She says she's been traveling more than a year, treating the campaign for OR-02 like 20 county-wide races, instead of one congressional district. 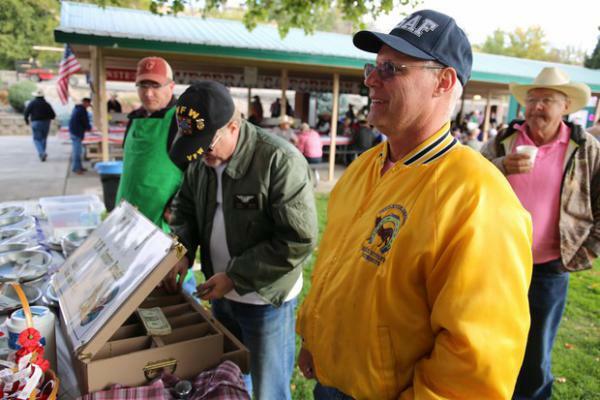 Veterans John Blagg and Sean Degan sell tickets while chatting about politics at the VFW's Cowboy Breakfast in Pendleton. Degan said he’s a registered Republican who supports term limits, even if it means losing an incumbent’s influence. “Change doesn’t happen from the same people being there fighting the same battles. It takes new voices and a shake-up,” he said. But Degan also plans to vote for Walden again. “I like him, I think he’s doing a good job,” Degan said. A few picnic tables over, fellow veteran Chris Eggo was of a different mind. Eggo said he believes Walden is out of touch with people like him. “The younger folks are working minimum wage, two or three part-time jobs … but, he’s got welfare checks for the big wheat ranchers,” he said. That’s a reference to $12 billion in farm subsidies championed by GOP lawmakers to ease the pain of the Trump administration's trade policies. 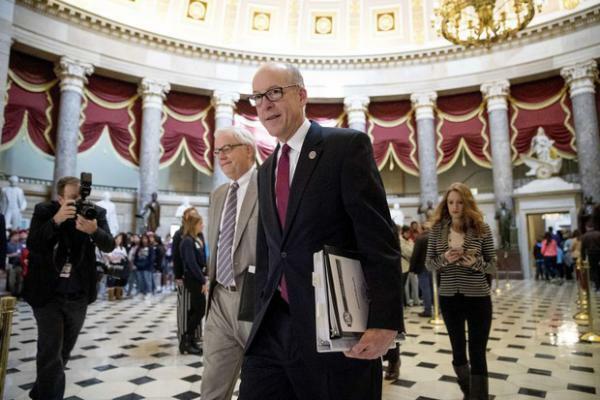 Walden has stuck closely to the party line under President Trump, and his loyalty has come with a big reward. 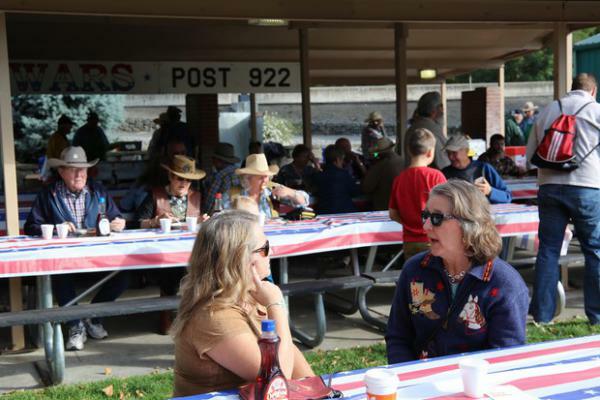 McLeod-Skinner has been campaigning and traveling around Oregon's huge 2nd District for well more than a year. She sat atop a city park’s wooden grandstand during the Pendleton Roundup, an American-Indian beauty pageant happening on one side of her and a rodeo on the other. “I'm not afraid of telling folks in Eastern Oregon that I'm gay. What makes me nervous is telling people in Ashland I listen to country music,” she laughed. McLeod-Skinner served eight years on the Santa Clara City Council in California’s Bay Area before a short stint as the city manager of Phoenix in Southern Oregon. She has a law degree and a background in water resource planning, which she sees as a strength. McLeod-Skinner said she’s bipartisan. Walden has said she’s an outsider, while his roots are in the district. “I grew up there, I grew up on a cherry orchard in The Dalles," he said. "I understand agriculture. I’ve fought for farmers and ranchers." Walden's been in Congress since 1998. Today, he represents about 1 in 6 Oregonians, and he’s quick to remind people who question his ties to the president that 19 out of 20 of the district’s counties elected Trump. “And they still have a positive view of the president, as of polling I did in July,” he added. Walden said there’s good news out of the administration, citing a historically low unemployment rate. Earlier this month, a bill of Walden's aimed at curbing the opioid crisis passed with bipartisan support. “And I think there's more work to be done on changing our federal forest policy,” he said. McLeod-Skinner’s campaign has raised more money than all the Democratic candidates to run against him in the past, combined. But that’s still a fraction of what’s in Walden's war chest. Details of who is backing Walden and who is behind McLeod-Skinner will become more clear after Oct. 15, the next deadline for campaign finance reporting. Meanwhile, neighbors and businesses from Oregon’s northern border to its southern reaches are planting campaign signs to declare their choice for the 2nd District.